It all began innocently enough in 2008. My good friend Ned Barnard, author of New York City Trees, asked me if I would design a map for a book about the trees and landscapes of Central Park that he was working on with Neil Calvanese, Vice President for Operations with the Central Park Conservancy. Ned and I began walking around Central Park together, discussing the project and studying the amazing variety of trees. I spent day after day making notes and sketches and taking thousands of photos of Park plant life. When I finally showed Ned a completed section of the map, he was impressed and offered to help produce it as an independent project. A map was born. 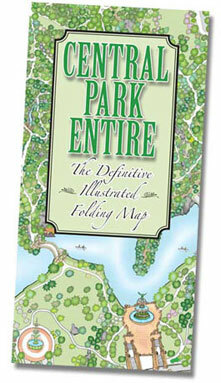 Central Park Entire, The Definitive Illustrated Map is the most detailed map of any urban park in the world. I spent over two years creating it, walking more than 500 miles as I documented over 170 different kinds of trees and shrubs. There are 19,630 trees drawn and placed in position on this map. Every tree symbol represents a real tree in the Park, and you can identify its genus or species with the accompanying tree legend. Over 200 illustrations show every bridge, archway, tunnel, building, statue, monument, recreational area, and playground. A brilliant aspect of the Park’s design was to leave most of the geologic features exposed to view. I sketched scores of these rocks and labeled many of them. Without the generous assistance of other Central Park Conservancy staff members I could not have created a map as complete and accurate as this. Thanks to the continuing efforts of the Central Park Conservancy, the masterful design of Central Park’s creators, Frederick Law Olmsted and Calvert Vaux, is even more evident today than it was in the 1870s when the Park was just completed. Just stroll under the great American elms that line The Mall, or gaze across the gentle folds and rises of Sheep Meadow, or wander along a quiet woodland trail in the North Woods seemingly miles away from the city’s noise and crowds. It is the enduring vision of Olmsted and Vaux and the stewardship of the Central Park Conservancy that this map celebrates. I am told that approximately 35 million people visit Central Park annually. I trust that you are one of them. You will be refreshed in spirit if you make time to visit Central Park again and again to see its wonders through the lens of the changing seasons. And if by chance on a visit you happen to notice a man with binoculars, toting a sketchbook and making notes in a tattered copy of the map, while looking up into some tall pin oak or tuliptree or elm, come over and say hello. I’ll likely be birding and working on updates to a new edition.